Jumbo Shells are a large, graceful, concave shape inspired by the shape of sea shells. This enchanting shape envelops the flavorful stuffing used to fill the shells. 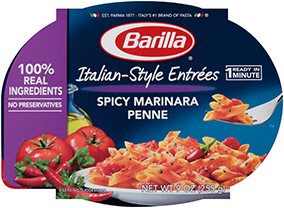 Barilla® Jumbo Shells is made with non-GMO ingredients. For more information, please read our position. Jumbo Shells are known for their generous consistency and heartiness, making them perfect for robust and highly flavorful sauces and the most sumptuous and creative fillings. Sauces can be chunky and abundant with moisture to facilitate oven-baking. Try Jumbo Shells with meat-based sauces like traditional Bolognese, dairy-based sauces like a classic béchamel, or vegetable-based sauces. For pre-bake cooking time; boil uncovered for 9 minutes, stirring occasionally. Drain and cool on a sheet pan. Fill shells according to desired recipe and bake. OR, to serve with your favorite Barilla sauce, boil uncovered for 12 minutes and drain well.